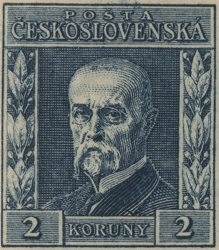 New definitive Czechoslovakia stamps were introduced in 1925, featuring the portrait of Czechoslovakian President Thomas G. Masaryk. The seven stamp denominations in this series were only issued for about one year. 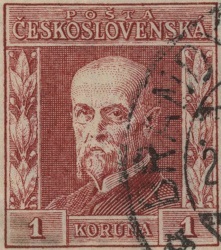 They are a very challenging part of early Czechoslovakian philately, with the varieties of the engraved Koruna denominations being extremely complex. The Scott catalog lists four different engravings of the Koruna denominations, each with distinctive markings. There are 14 collectible varieties of the four high-denominations, as listed in the Scott catalog. I have seen images of some of the listing tables in the Michel and Czechoslovakia specialized catalogs, and the range of possible varieties is mind-boggling! The presentation on this page is per the 2008 Scott Classic Specialized catalog or the 2015 Scott Standard Postage Stamp catalog. 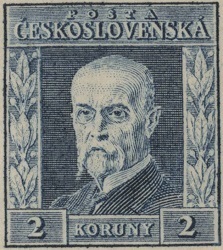 The three higher denomination definitive Czechoslovakia stamps shown above were issued in 1925. They are all photogravure, printed on paper with WMK 107, and are perforated 14. 40 H. (1925 - Sc. #95) - Brown Orange. 50 H. (1925 - Sc. #96) - Olive Green. 60 H. (1925 - Sc. #97) - Red Violet. 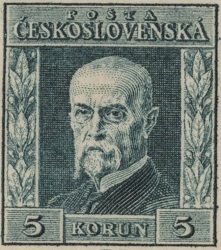 The four Koruna denomination Czechoslovakia stamps of the First Engraving are shown above. They are perforated 14. Background of horizontal lines in top and bottom tablets. The inscriptions are in Roman letters with serifs. Shading of crossed diagonal lines on the shoulder at the right. "T" of "POSTA" over the middle of the "V" of "CESKOSLOVENSKA". Three short horizontal lines in the lower part of the "A" of "CESKOSLOVENSKA". 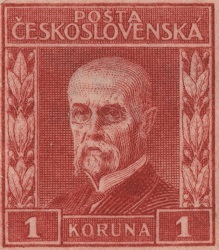 1 K. (1925 - Sc. #98) - Carmine. 2 K. (1925 - Sc. #99) - Deep Blue. 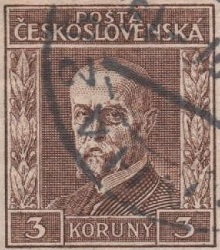 3 K. (1925 - Sc. #100) - Brown. 5 K. (1925 - Sc. #101) - Blue Green. 1 K. (1925 - Sc. #101A) - Carmine. 2 K. (1925 - Sc. #101B) - Deep Blue. 3 K. (1925 - Sc. #101C) - Brown. 5 K. (1925 - Sc. #101D) - Blue Green. 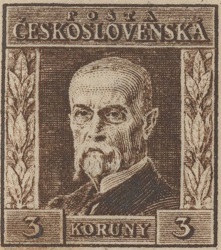 The three Koruna denomination Czechoslovakia stamps of the Second Engraving are shown above. They are perforated 14. "T" of "POSTA" over the right arm of the "V" of "CESKOSLOVENSKA". One short horizontal line in the lower part of the "A" of "CESKOSLOVENSKA". 1 K. (1925 - Sc. #102) - Carmine. 2 K. (1925 - Sc. #103) - Deep Blue. 3 K. (1925 - Sc. #104) - Brown. 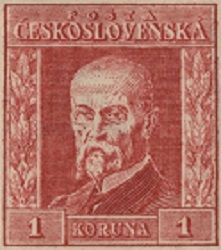 The one Koruna denomination Czechoslovakia stamp of the Third Engraving is shown above. It exists either perforated 10 or perforated 14. Shading of single diagonal lines on the shoulder at the right. "T" of "POSTA" over the right arm of the "V" of "CESKOSLOVENSKA". Blank space in the lower part of the "A" of "CESKOSLOVENSKA". 1 K. (1925 - Sc. #105) - Carmine Rose. 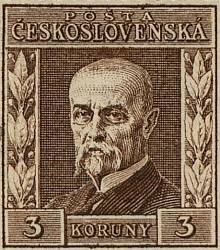 The two Koruna denomination Czechoslovakia stamps of the Fourth Engraving are shown above. The 1 K. denomination is perforated 10 and the 3 K. denomination is perforated 14. Background of crossed horizontal and vertical lines in top and bottom tablets. The inscriptions are in antique letters without serifs. 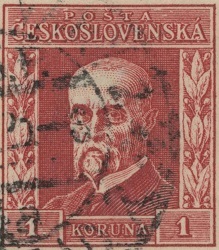 "T" of "POSTA" over the left arm of the "V" of "CESKOSLOVENSKA". 1 K. (1926 - Sc. #106) - Carmine Rose. 3 K. (1926 - Sc. #108) - Brown. Paper with the Linden Leaves watermark (WMK 107) was first used in 1925. There are two orientations of the watermark, as illustrated above. The watermark was discontinued in 1927.